Some years ago, I was listening to one of my favourite songs – Aa jaane jaa from Inteqaam. S, who usually recognises music directors by the way a song is composed, wondered whether the song was composed by RD Burman, and was quite surprised when he learnt the music directors were Laxmikant-Pyarelal. That got us into a discussion about 'RD's sound'. My introduction to RD had been rather unfortunate – I grew up in the 80s and my father dismissed RD as 'that noise maker'. A long time passed before I realized there was more to RD than 'noise'. This discussion also reminded me that while RD was most closely associated with Kishore Kumar and Asha Bhosle, he had used other singers to great effect. 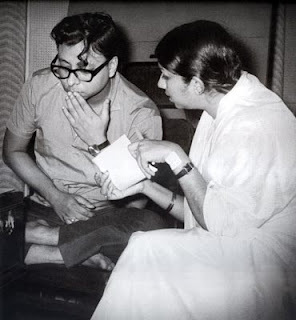 In fact, Pancham, as RD Burman was affectionately called, had a great regard for Lata Mangeshkar (a regard she returned), and gave her some wonderful songs to sing. Here are some of my favourites, in no particular order. Picturised on Sheila Vaz, who appears in a cameo, this is one of Pancham’s finest compositions, and is widely regarded as his first independent composition. According to Anirudha Bhattacharya and Balaji Vittal (RD Burman, The Man, The Music), the tune was originally composed for Guru Dutt’s Raaz, which was based on Wilkie Collins’ Woman in White. The film, starring Waheeda Rehman and Sunil Dutt was unfortunately shelved. It was then reused for Mehmood’s Chhote Nawab, which became Pancham’s debut film. The semi-classical number is exquisitely sung by Lata, who recalls meeting Pancham as a young boy at his father’s recordings. Ghar aaja ghir aaye was also responsible for ending the estrangement between Lata Mangeshkar and SD Burman – Panchan was adamant that he wanted Lata to sing his first composition, and SD encouraged the wish. Music director Jaidev played messenger, and the rest is history. An achingly haunting tune, sung with great poignancy by Lata. It was one among the many beautiful melodies composed by Pancham, fresh from the success of Teesri Manzil. In the context of the film, however, the song seemed out of place. It did not help that the film helmed by Nasir Hussain was a failure; perhaps it was the story – the serious tale of unemployment and despair was not what the public expected from a Nasir Hussain film. Perhaps it was that it was shot in Black & White in an era where colour had become the norm. Even changing the original ending to a happy one did not change its fate at the box office. Its failure hit Nasir Hussain hard, but Hindi film songs have a life of their own, independent of the fate of their films, and the songs, including Kya janoo sajan have retained their popularity over the ages. This song, tuned in C minor (RD uses both the melodic and harmonic scale), introduces Lata's voice in an almost instrumental movement before the actual lyrics are sung. The lack of any direct percussion instrument at the beginning of each antara seems to create a question that is answered when the percussion comes in at the antara's repetition. The film is not one of Hrishikesh Mukherjee’s better efforts, but it was a pleasant watch nevertheless. Buddha Mil Gaya was the story of an old man (Om Prakash in a leading role) who's on the run and two impecunious young men, whose get-rich scheme embroils them in murder. Pancham rose to the occasion by composing a variety of tunes from the soulful Manna Dey number ‘Aao kahan se Ghanshyam’ to the romantic Kishore solos ‘Raat kali ik khwaab mein aayi’ and ‘Bhali bhali ik soorat’, to this one, Lata’s flawless rendering of Jiya na lage mora. Based on Raga Khamaj, this song has some lovely melodic movements in Lata's voice: note the way she takes "na ja re na ja re na ja o jiya na ". In, the first antara, she stops at "do pal toh teher ja" before the repetition, increasing the tension, the longing. The flute interlude , when the camera pans to Lalita Pawar, is very close to the flute in "Bada natkhat hai ye" (Amar Prem). Did RD use it to hint at the relationship between a mother and child? Notice the slight dissonance as Lalita Pawar disappears; the flute notes go lower, and the strings draw a sinister line against the higher quartets of notes on the flute (and perhaps a glockenspiel), as an inebriated Om Prakash totters up, before seguing back into the antara. One of my favourite RD compositions, Baahon mein chale aao has made its appearance on several of my lists. Lata brings out the impishness in the lyrics, and Jaya Bhaduri epitomized that playfulness on screen. Tune, lyrics, singing, picturisation, all come together to provide us with a classic Hindi film song. The guitar moves the song along in the beginning, with the strings entering softly in the background until they move centrestage with short, high notes supporting Lata's voice. The percussion and bass guitar help this forward movement. But, for me, it is the mukhda that contains the memorable portion. The first line has an odd chord change that seems to have an added ninth note. Then, it is the way Lata sings 'Humse sanam kya parda” and you can see she differs in the repetition... the first time she sings 'kya parda', the last syllables are pitched deeper, whereas in the repetition, they remain on the same note as 'Kya'. The first occurrence is a question; the second, a statement. This was RD’s second collaboration with Gulzar after Parichay (1972). While I mentioned how Hindi film songs have a life of their own independent of their films, that is obviously not true of all songs. (Madan Mohan would agree.) Doosri Sita’s box-office failure meant that its score was erased from collective memory. Din jaa rahe hain raaton ke saaye is a poignant song with an undercurrent of melancholy. Filmed on Jaya Bhaduri as the protagonist (with glimpses of Lalita Pawar and AK Hangal), the song, written by Gulzar plays on in the background. This song is a precursor to melodic lines that would be heard later in Aandhi. The lines are slightly monotonous, without much variation, but it has a lovely prelude. The first interlude is memorable for its use of dark strings and an almost-Raga Lalit-like movement. The last verse is slightly different in the way Lata sings and reaches for 'daaman toh choote'. The Gulzar-Pancham collaboration was an enduring one, and gave us some beautiful songs to listen to (even if Pancham complained that Gulzar would ask him to set The Times of India to music). Kinara, a film helmed by Gulzar, saw Pancham set music to Ab ke na saawan barso, a touching expression of a woman’s helplessness (the heroine is visually impaired), and Gulzar's focus on the barred windows only emphasises that helplessness. The tunes in the film went against RD’s image of a ‘westernised’ composer. RD often complained that while his father was alive (and sometimes even after), his classical compositions were attributed to his father. Amar Prem saw RD offer a variety of exquisitely tuned melodies, including Bada natkhat hai re (where he says he was excoriated by his father for not being creative enough), Chingari koi bhadke and Kuch toh log kahenge. It was Amar Prem which saw RD gain his father’s approbation; the senior Burman was extremely happy with his son’s output for the film. Forming an integral part of the movie, the song (in the background) expresses the emotions of a woman who feels affection for a motherless little boy but cannot forget that he's the living symbol of her husband's infidelity. She cannot bear to see him in her home, but children have a way of winding themselves around your heart, and she knows she'll miss him when he leaves. It's complicated. The wealth of expression that Lata brings to this song, with its very minimal instrumentation makes it all the more effective in context. Very minimalistic, with most of the music carried by the bass guitar behind Lata to bring out Gulzar’s lyrics, which are, at times, almost recited instead of sung. The interludes are a little more fleshed out with the sitar, sarod, etc., but one comes away with a memory of the lyrics, Lata’s voice and the bass guitar (if one heard it on a record; Vividh Bharati and AM could never reproduce the bass guitar on a transistor). The film that saw the professional metamorphosis of Rekha (and won her a well-deserved nomination for Best Actress), Ghar was another RD-Gulzar combination that worked wonders. With a stellar score (five songs, each one a gem), the composer-lyricist duo matched their earlier outings. Lata effortlessly brings out the emotions of a woman missing her beloved. I'm not a great fan of lyrics that go 'Aapke kadmon mein hi rehna hoga' but I have to confess that the song itself is a wonderful melody. Having first rejected Bhola for tricking her into believing he could sing, Bindu realises that she's not just in love with his voice. When his rival (Mehmood) has Bhola attacked by thugs, Bindu's emotions spill over as she nurses him back to health. A great song based nominally on Raga Abhogi (some people say the Raga is Bageshri). This piece by Ustad Rashid Khan always reminds me of this song. RD showcases a variety of instruments: it starts with an electronic keyboard roll, followed by a guitar-flute combination, which in turn segues into the santoor playing a few notes, and then, a strummed guitar. Lata comes in with the tabla, and apart from the strings accompanying her, we think the rest of the music is going to be classical. However, in the first interlude, we have brushes on the drums, with the santoor and strings. In the first antara, the tabla does not make an appearance till the repetition of the first line, but you can hear the brushes on the drums throughout. There is a delectable sitar run in the second interlude followed by the taar shehnai. The third interlude uses a shehnai, which changes suddenly to a strings-and-sitar combination. The ending is interesting with the strings taking the melody from Lata, and then it's just her voice softly repeating the first line. For the longest of time, my favourite song from Caravan has been Daiyya ye main kahan aa phansi. I ignored Dil bhar dil se pyaare as a pleasant song; it was not something I went out of my way to hear on repeat. Until recently, when S saw my list of RD-Lata and asked why this song wasn't on it. Let me just say that my previous opinion of the song turned a 180. I'm impressed by how smoothly Lata takes the notes, especially the repetition of 'nainonwaale' in the second antara. Each repetition is sung differently, and Lata beautifully aces the rise and fall of the notes. RD was probably one of the first composers to think of a soundscape for his songs, that is to say, he was interested in sound as a conveyor of melody and rhythm rather than the other way around. His soundscapes became more pronounced as he experimented with different instruments and noises and orchestral and electronic techniques. The alternation of the soprano saxophones and the rabab with two banks of strings (note the notes from the violins and the piccolos in the interludes), the odd sounding instrument at the beginning of the song, the notes slightly off beat, Lata moving between quick staccato and long drawn out notes, accompanied by both male and female choruses – it all conveys a sense of back-and-forth oscillation to the song: even as the sound dies out, the song itself doesn't seem to end. What are your favourite Lata numbers for RD?